My point on the Hutongs, Mary-Jayne (and see left for a 2007 view of the old simple-but-communal Beijing making way for the much-less-attractive new), was that most people in China and around the world would choose, rightly or wrongly, and whether to later regret or pleasure, to go for the neat, energy-consuming, marbled-floored suburban house rather than the hutong. I completely agree with you about the much higher quality of life and community, not to speak of sustainability, in the old ways. But when presented with a choice of hard work and sustainable simplicity, or resource-hungry luxury, I fear that human beings of all cultures and backgrounds are programmed to go, in their bulk, for the easier option. Whether Amazonian tribesman or newly-comfortable middle-class Chinese or Indian. So my blog question, what would YOU choose, isn’t really addressed to us white, middle class, Western greens, who now for the moment do have the luxury of choice (and how many of us, even green-minded us, have so far chosen to give up our unsustainable central heating, cars, travel, eating habits, lifestyle?). It’s addressed rather to the primitive Ur-Mensch within us all which still craves the sugar, the fat, the salt, the warmth that would have ensured survival a million years ago on the African savannah. 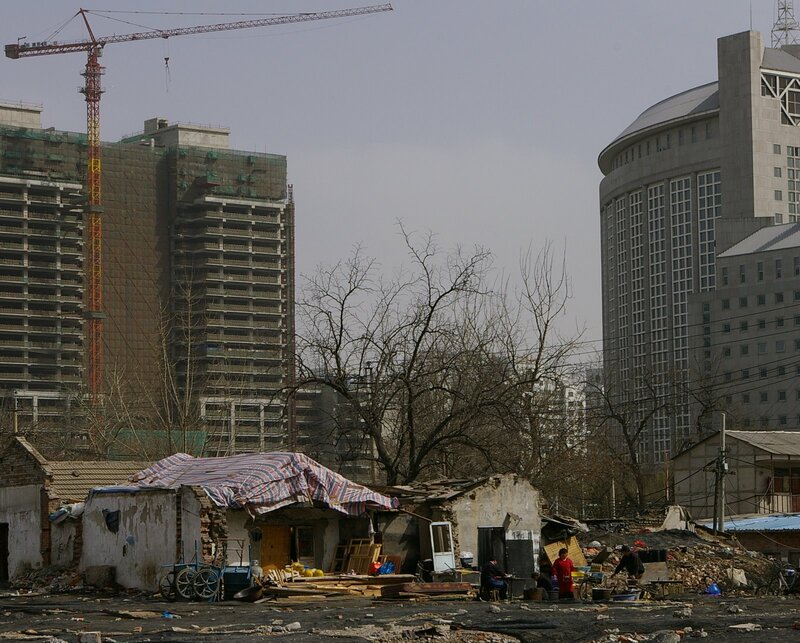 That why I believe that nine out of 10 would and for the moment will still – wrongly and regrettably, and in that you’re entirely right – choose the new build over the Hutong. Until we understand at a much more primitive level – and this is coming – that those choices will kill us. Now, science. I again suspect we’re much closer in our views than my sometimes black-and-white/desperate (not intentional, but a long-standing issue for therapeutic exploration after an early history of not being heard…) presentation of my own thoughts might suggest. It’s enormously worth reading Lovelock’s gently written but alarming new book, which I’ve got this week (“The Vanishing Face of Gaia“) where he challenges the reductionist scientific view of Earth systems (including much of the research that has driven the compromise conclusions of the IPCC) and urges instead something that hugely resonates with me, and I suspect with you, Mary-Jayne (although he doesn’t quite formulate it this way), which is an intuitive science based on a FELT understanding of the living world in and on which we live. And it’s that FELT knowledge that warns us – including in our dreams, where I have twice this week experienced being in an earthquake, once in a mud-built chapel, and once in a super-high-tech city) – that we are approaching massive and devastating change. I greatly respect the spaces where our emphasis remains different, Mary-Jayne, and I’m very glad how much common ground there is between us, especially over the central piece of knowledge that very large numbers of people are going to die. That raises so many, for us green Westerners, uncomfortable issues, some addressed by Lovelock when he wonders how we on what he calls “Lifeboat Islands” such as Britain or New Zealand will decide who to allow on board and who not. The Titanic metaphor becomes ever more relevant, and it won’t be very pretty. Some quotes from Lovelock’s early pages, which (probably because I’ve learned so much from him) resonate with what I have come to understand. Lovelock makes for me the blinding obvious point, still very little discussed publicly, that “with our people, pets and livestock, we are already simply more than the earth can carry.” No voluntary human act, he continues, can reduce our numbers even to slow climate change, adding that we (and I think he means us collectively rather than individually) do not seem to have the slightest understanding of the seriousness of our plight. And what fascinates and possibly even terrifies me, Mary-Jayne (although curiously I don’t actually FEEL any terror, just increasingly quiet and deep acceptance/resignation), very few writers/speakers/thinkers in Western political or journalistic discourse (although Mark Lynas does of course in Six Degrees) so far seem to be addressing what this interim period, between present temperatures the new hot state, and especially between 7-9 billion people and a billion or less, will be actually like. And what that means for decisions that need to be made now. If humankind goes down to one billion by the end of this century, as Lovelock predicts, how will we bury and mourn the extraordinary numbers who will die. A plague hugely more destructive than even the Black Death at its worse. And what will be left of our hugely complex and interlocking economic and social/political systems when 90 per cent of workers and leaders and farmers and doctors and builders are dead . Unimaginable. Or more accurately, too terrifying to imagine. I’m aware I haven’t really answered your question, Mary-Jayne, asking what, if we ARE toast, we should now do? I suspect that as catastrophe begins to take hold – whether in 10 or 50 years, but it certainly won’t take as much as a 100 years – we will have less and less choice about what we actually do do. We will find ourselves mourning not out of choice, but because people and Peoples we know and love will begin to die in large numbers, and that will unleash profound and predictable grief for those (I nearly wrote, “of us”, though that “us” is hardly a given) who survive. As centralised energy systems, transport and industry break down, we won’t have any choice but to refocus on renewable, local energy, (I’m at last ordering a solar hot water system for when we have neither gas nor electricity), on local food production, on organics and so on, and all the green things which are at the moment among many other choices we can make. The answer to what we CAN and MUST do, therefore, lies in my view less in the technical detail than in the emotional preparation. Which means talking, talking, talking. More important at this point than anything else. We need to be making connections, building communities and friendships. And being utterly, totally honest about the reality of where we now find ourselves. Even if we don’t all become Transition Towns or put solar panels on our roofs. As Lovelock says, “Our goal now is to survive and to live in a way that gives evolution beyond us the best chance.” A humbling responsibility. what a relief to hear you sketch out some of the process between now and whatever temperature we fear the earth will reach. I am often struck by how much focus there is on that ‘end’ point (the epic climatic climax) and not enough on the interim.I have a slightly different take on Lovelock’s view that it is hubris to think that humans know how to save the Earth. “The planet looks after itself. All we can do is try to save ourselves.”Firstly, we are already powerfully changing the Earth. Secondly, we have known what to do to correct our actions for decades, and yet we have failed to do that. In contrast to what Lovelock seems to be saying, I think it is negligent to think we *can’t* know and therefore not try. Yes it would be hubris to think we know everything, but there is much that we do know, or can at least make a wise guess, and that knowledge is power (and therefore responsibility) to act. So we should try, not just to save ourselves, but the life on earth that we are steadily destroying.As for just saving ourselves, to be honest, I dont care as much about saving humanity, especially if it continues to come at a cost to the rest of life on earth – which as desperation increases, I guess it will. It wont just be us/those humans who survive that will be grieving, elephants and whales clearly and recognisably grieve and I imagine in some way trees do too and the whole, wider consciousness of life. I’d say: our actions and inactions place us in a position of responsibility, While the planet looks after itself (and us), we can alsolook after the planet – not in a power-over sense, but a power-with.Another thing that strikes me, is that climate change isnt a single event – that end point. It is a gradual (or sudden) set of changes. There are several tipping points, we might not be able to stop the first one, but can we prevent even worse? At what point do we throw in the towel and carry on flying and partying and burning coal while the climate and life on Earth continues to change? Do we transition to a low carbon lifestyle simply because it’s better, whatever the outcome climatically? And do we need to commit to deep transformation – personally, socially, culturally, ecologically – as part of the inevitable process?